How about another Rancho Alegre good time at the Moose?! You've been asking, and Rancho Alegre Radio listened! 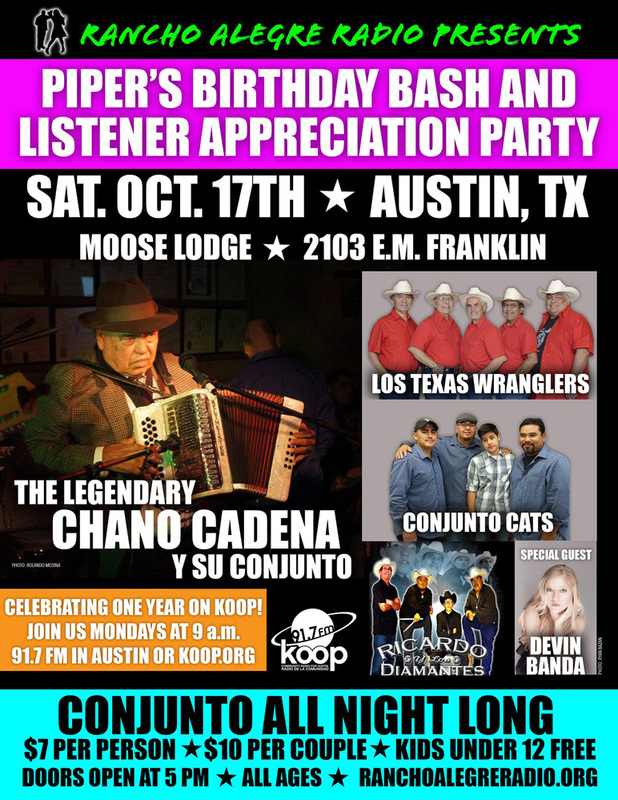 We're super excited to announce a special one-night only conjunto event! See conjunto how it's supposed to be experienced! Live and in your face in a family dancehall setting. Chano Cadena y Su Conjunto - Legendary acordeonista from Alice, Texas with over 60 years in the business. Los Texas Wranglers - Austin's own award-winning conjunto led by Julian Limon Fernandez. Conjunto Cats - Up-and-coming conjunto from Seguin with 12-year-old Zeke Campos on accordion. Devin Banda - The mega-talented rising Tejano star from Kyle, Texas will make a special appearance doing conjunto! Ricardo y Los Diamantes - Local conjunto from Kyle! As with all our events, all ages are welcome. The Moose also has a full bar with great prices. Cover charge only $7 per person or $10 per couple! Kids under 12 are free! We'll be celebrating our one-year anniversary on KOOP Radio and Piper's birthday! We hope you'll join us and help spread the word to your conjunto-loving friends! Stay tuned for updates!